“Soon, the first snow will come. 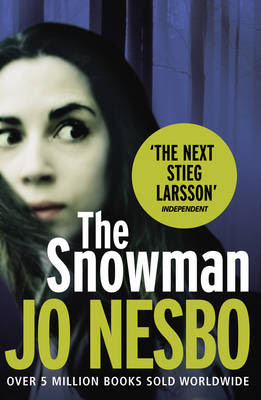 So goes the blurb of “The Snowman” by Jo Nesbo….chilling enough to evoke interest in an author I hadn’t even heard of before, and so well suited to the title that I wondered if that was the reason the cover didn’t have a snowman at all. Jo Nesbo is a Norwegian award winning author and musician, and his bestselling novels have been translated into 40 languages! And to think that before this, I hadn’t heard of him at all!!! Touted as the next Stieg Larsson, he is best known for his mystery novels involving Inspector Harry Hole. ‘The snowman’ is the seventh in the Harry Hole series, of which there are now 10 novels, all translated into English by Don Bartlett. The book tells us the story of a serial killer on the loose. One who has killed several women, but has never aroused the least suspicion, since he has always been extra careful, and also the fact that he has disposed of the bodies so well that they have never been found. It is Inspector Harry Hole, who, on the trail of several women who have gone missing over the years, stumbles to the realisation that there is a killer somewhere out there targeting women, especially wives and mothers. Harry, battling his own demons of broken relationships and alcoholism problems, finds his way amidst the mess, egged on by an anonymous letter he has received, and as the bodies pile up, leaps to one conclusion after another, not all of which are the right ones. The fact that he eventually does arrive at the correct solution is not surprising. After all, what is a thriller without twists and turns? And which author would leave a crime unsolved or a killer loose out there? Unless of course, he plans a sequel! The book is racy and a page-turner. The characters are well sketched, but understated, without detailed descriptions, but giving us a good idea of what they are like, how they think and what they might do. The author’s wry sense of humour comes across every now and then, and I wondered if the character of Harry Hole was somewhat autobiographical. The characterization of the women is interesting. Both, Katrine and Rakel, are strong, independent women, and so are some of the victims, but all of them eventually are just as vulnerable, when it comes to their personal lives, their relationships, and eventually the killer. I couldn’t help but wonder what some of my friends would think of such a characterisation. It will surely make for an interesting discussion sometime! All in all, the book is a good read, and I am now curious about the other Harry Hole books! Would love to hear what you think of the book, Atula. Am discovering so many new authors these days, and wondering how I hadnt even heard of them till now! you are welcome, Bidisha. but then again, I dont really know if you will enjoy this one or not. After all, books are as much a matter of taste as food!! I have read Dan Brown's Inferno, and enjoyed it, but not as much as his earlier books. As for the cuckoo's calling, havent read it yet. I have enjoyed her Harry Potter series, but that doesnt necessarily mean i will enjoy this one, so it remains to be seen :D Would love to hear what you think of this book, though, if u read it, let me know. Great :) I am looking forward to reading the first Jo Nesbo book soon, thanks to your recommendations.